Didn't know what to expect, hadn't been to a dentist office in years. I was blown away with how nice theoffice was, friendly ALL of the staff was, not to mention Dr. Tran himself was incredibly kind and informative. I don't expect to go to any other office from here on. Didn't know what to expect, hadn't been to a dentist office in years. I was blown away with how nice the office was, friendly ALL of the staff was, not tomention Dr. Tran himself was incredibly kind and informative. I don't expect to go to any other office from here on. Dr Henry Tran completed his undergraduate work at University of California, Riverside, and his medical degree from University of Pittsburg, School of Dental Medicine Pittsburgh, Pennsylvania. During his school years, he was an enthusiastic student who volunteered at Coastal Community hospital for General works in CA, Monteiore hospital for oral surgery in PA, and VA hospital for prosthodontal works in PA. Also, he was a lab technician in University of California, Riverside who worked with pH meters, gas chromatograph for research experiments, a tutor who aided new students with General Science courses & pre-clinic works, and a dental assistant who took part in General dental works. Dr Henry Tran successfully passed the Dental Board of Northeast Regional licensure examination in May 2001 and Board of California licensure examination in October 2001. He then quickly became an active member of California Dental Association, San Diego Dental Association, and American student Dental Society. 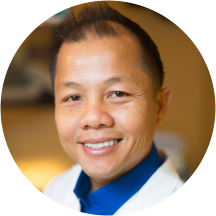 Dr Henry Tran is a skillful and dedicated dentist whose proven ability to ensure that dental practices are continuously updated to provide first rate care to patients. He is a highly motivated and confident individual with exceptional organizational and communication skills. He is able to communicate effectively and sensitively with patients to maximize the recovery effect. Dr Henry Tran is ready and qualified for the next stage in his career as well as is looking forward to making a significant contribution as a family dentist. Very informative, friendly, and did a fantastic job. Dr Henry was very accommodating and his whole staff was very nice. Great experience! The absolute kindest, most gentle dentist I have ever visited. His staff are so friendly and efficient. Even though I arrived a bit early for my appointment, I was seen right away. Would return anytime and will highly recommend to all friends and family. He has a pleasant personality, very friendly, he has a very clean office,very professional I recommend him to everyone. Dr. Tran was very nice and helpful, and explained everything to me that I needed to know. Didn't seem to be interested in my business. Referred me to a specialist only after a few minutes. Hard to understand and offer very little insight. After X-rays, done in 5 minutes. Hard to find a doctor that really cares. Disappointing. Every time I come to Dr. Tran it is an excellent experience! He is so courteous and shows he cares. I would recommend him to family and friends!!! !